Both research centres within the Faculty of the Arts (Technology Driven Art and Autonomy and the Public Sphere in the Arts) have taken the initiative of organising a contest for the best thesis or documentation of work: SCRIPTIEKUNST.ORG. You can discover the winners of the Scriptieprijs 2017 over there! The aim is to stimulate an original and inspiring approach to theses within the Faculty of Arts of Zuyd. The contest is aimed at all bachelor- and master art students. It is a high tech opera, with 11 projectors driven by 5 minMac's. I use the Troikatronix Isadora software to drive them all wirelessly. Students from the Performance department at the Toneelacademie Maastricht learned on the job how to cope with the technological and artistic problems of such a huge project. Especially to mention are Kaz Schonebeek (my assistant) and Casper Wortman - my video assistant, who co-created a lot of the Ultra high definition video material of the show. Special thanks to Bernhard Lang and Klaus-Peter Kehr for the confidence. For me it's important to make my work as an artist, an active part of my artistic research within Technology Driven Art. How does a silent movie as an opera libretto, influence the final composition? An overview of the press reviews can be found here. * A few new video installations for the Mozartsommer Festival in Mannheim and Schwetzingen. Based on the aria 'Basta Vincent' by Mozart, written during his short stay in Mannheim, Peter Missotten conceived two twin video installations in collaboration with Peter van Til. 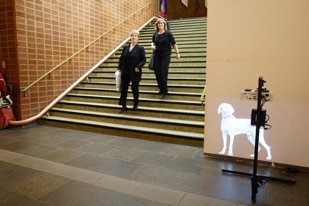 In the foyer of the Nationaltheater Mannheim…. It's pretty weird and funny to see that a huge Private Company commercialises it's robots, by pointing out it's human weaknesses… It stumbles like a human, it falls like a human and it get's up it's feet like human… Maybe some artist should make a stations of the cross, by a robot… could turn out to be the ultimate selling proposition. On an even more romantic note, replacing fireworks by drones is a nice project. Not sure it's a lot safer: what comes up, must come down. But then again, there is this report. Both Ruth Benschop and Peter Missotten made their inaugural speech on nov. 6 2015 in Maastricht. On this occasion, they publicised a beautiful book, uniting both texts - back to back. If you would like to receive this book - a true collectors item - please contact us! Ruth Benschop - De Eland is een eigenwijs dier. Hundreds of scientists and technologists have signed an open letter calling for research into the problems of artificial intelligence in an attempt to combat the dangers of the technology. Signatories to the letter created by the Future of Life Institute including Elon Musk and Stephen Hawking, who has warned that AI could be the end of humanity.